A British MP is writing to the prime minister of Pakistan urging him to intervene in the case of a woman from Bradford allegedly murdered in a so-called "honour killing." Samia Shahid died while visiting relatives in 2016, but legal proceedings have been subject to repeated delays. Her ex-husband has been accused of her murder. Labour MP Naz Shah said she had "concerns" about the case. The BBC understands Samia Shahid's first husband, Chaudhry Muhammad Shakeel, has been freed on bail due to a lack of progress in the trial. He denies her murder. The Bradford West MP said she wanted Prime Minister Imran Khan to intervene and make sure "that the state are prosecuting and are taking real care of what they are doing". "The fact that he [Mr Shakeel] has been released on bail does really raise my concerns. I'm really worried about the state of the case." She added that the delays were "unacceptable" and that the Pakistani authorities should be pursuing a conviction on the basis of forensic evidence that had been obtained in the case. Ms Shahid died in July 2016, aged 28, at her family's ancestral village outside the city of Jhelum in northern Pakistan. 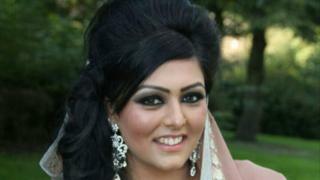 She had an arranged marriage with Mr Shakeel, her cousin, in Pakistan in 2012 but the couple's relationship broke down. She married another man, Syed Mukhtar Kazim, in Leeds in 2014 and moved to Dubai. Mr Kazim has claimed Ms Shahid's family strongly disapproved of their marriage. He claimed his wife was killed after she travelled to Pakistan after being told her father was seriously ill. It was initially ruled that she had suffered a heart attack but a post-mortem examination found she had been strangled. Ms Shahid's father, Chaudhry Muhammad Shahid, was held as a suspected accessory to murder but released on bail. He died in January 2018 in Pakistan.